Our Lodge was originally the "Boarding House" for a Lumber Company Farm. Years ago lumberjacks stayed at the farm in this Boarding House during the summer, planting crops such as potatoes, turnips, oats, and hay and then harvesting them to store and feed the many horses and men in the logging camps. Now the modernized boarding house comfortably accommodates 2 hunting parties of 8 or more. 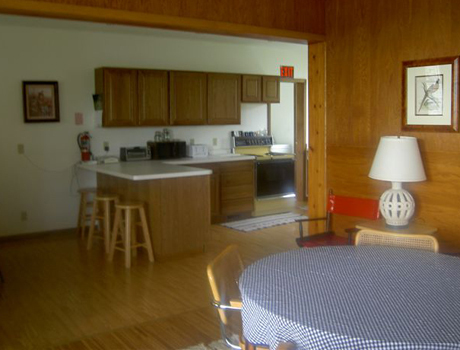 Each has a fully equipped kitchen, living room, and dinning area and porch. A washer and dryer is available for those garments that need to be cleaned during your stay. Arrangements can be made to have a chef come into the spacious kitchen to prepare your meals, or you can be your own cook. Hunt Club Weekends are by Reservation, for 8 people, and include 2 nights, 64 birds and guide service. The cost for 2 nights is $2000 (tax included) . A Hunt Club Weekend for 6 people , 2 nights, 48 birds and guide service is $1500 (tax included) Additional birds for $18 each. Kennel facilities are available for your dogs. Rates subject to change, contact us for more details.